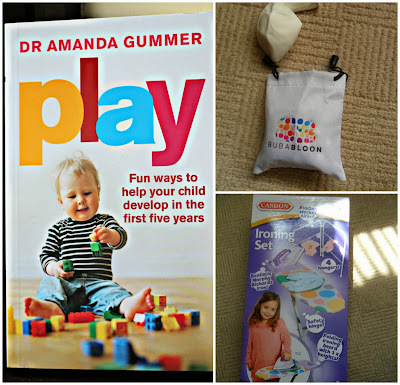 Confessions of a Single Parent Pessimist: A Book About Play and Some New Toys! A Book About Play and Some New Toys! Play has been the theme of this week, inspired by an impressive new book I've read, that's funnily enough called Play. Child Development Expert and Play Psychologist Dr Amanda Gummer has written a guide of activities and advice for parents focussed on the first five years of a child's life. Play includes fun little games for babies such as peekaboo, advice on toys that are great for each developmental stage, ideas of how to use music within play and even tips on how to manage tantrums, ADHD and even sibling rivalry. Due to my work with children in foster care over the years I have attended play therapy courses and many courses on child development, so I enjoyed refreshing my knowledge in these areas and applying them to my own child. The activities featured are aimed at increasing a child's confidence, mobility, creativity and their cognitive and social skills whilst both the child and parent are having fun, so I totally recommend it if like me you ever get stuck in a rut (rainy days at home are the worst!) and want to teach your children something new whilst having fun and bonding with them. Chunk has had two new toys to play with this week, which both meet this book's criteria of being both educational and fun. The idea of the Bubabloon is so simple yet so clever: a fabric balloon cover that keeps a balloon from popping, so it can be played with for longer and there's no risk of young children choking! Mumpreneurs Elena Torres and Lorna Edwards created this and it comes in quite a few colours and fabrics, including pirates, camper vans and various animals. Young children get to improve their mobility, balance and hand-eye coordination skills by playing with balloons, as well as have lots of fun and giggles. Chunk loves balloons, and tends to end up popping them by mistake or they shrink over a few days and both of these things end with a hysterical and stroppy Chunk, so thankfully I have been able to avoid this by using this Bubabloon! It also means I don't have to sit there with my eyes closed and hands gripping the arm chairs in fear of the balloon being popped (coward I know!) whilst he is trying to use it as a space hopper or is poking it with his (potentially) sharp nails. The second toy Chunk has tried out this week is the Casdon Ironing Play Set. The set is designed to be quite true to life, with a Morphy Richards toy iron, collapsible and height-adjusted ironing board and even an airer and clothes hangers! 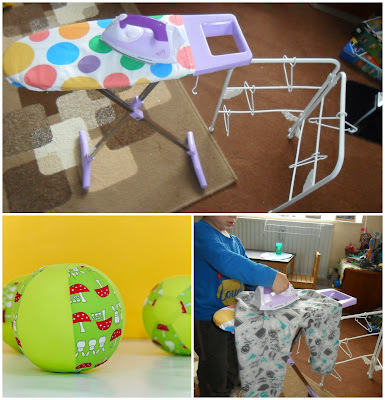 These sort of toys enable children to explore role play (great for expanding their imaginations) and they can play these games whilst you do your actual housework so they feel they are copying you and playing a game with you. This set also helps children to understand cause and effect and is great for their motor skills. Chunk has always had toys like this including a kitchen, baby and buggy, construction set and even a cleaning set which has sweeping brushes and a toy mop and bucket! He loves using his toy vacuum when I am using my real one, and we even have vacuum races sometimes. Chunk likes this ironing set and he had fun trying to iron his clothes and then hang them on the airer- he knew how to hang them as I'm forever putting washing on my radiator airers, but he was initially baffled about the iron as I don't iron. I'm not even sure I've ironed once since he was born! But once I showed him what to do he soon got into it and then used the ironing board as a launch pad for his cars, showing how big his imagination already is! For the purpose of this post I was sent these products to test and review. No payment was received and all opinions are honest and my own. Love the idea of the Bubabloon! Great!